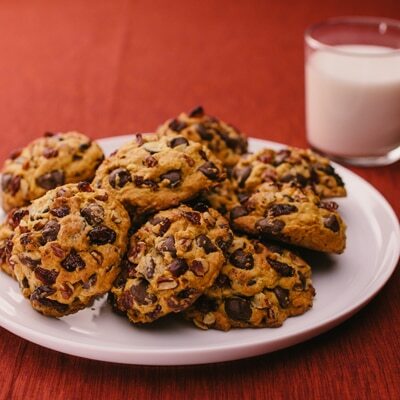 A perfect combination of sweet cranberries, pure pumpkin and creamy dark chocolate make these Pumpkin Dark Chocolate Cranberry Cookies from Jamie Lothridge of MyBakingAddiction a go-to treat to enjoy anytime! PREHEAT oven to 350° F. Line 3 baking sheets with parchment paper. COMBINE flour, oats, baking soda, pumpkin pie spice and salt in medium bowl. BEAT butter, brown sugar and granulated sugar in large mixer bowl until light and fluffy. Add pumpkin, egg and vanilla extract; mix well. ADD flour mixture; mix well. Stir in pecans, dried cranberries and dark chocolate morsels. USE a large cookie scoop (3 tablespoons) to drop approximately 8 scoops of dough per prepared baking sheets. BAKE for 14 to 16 minutes or until cookies are firm and lightly browned. Cool on baking sheets for 5 minutes; remove to wire racks to cool completely.